The holiday season is in full swing! I’ll be finding myself spending time with friends and family, reminiscing on the year and making plans for the future, and part of the reminiscing has brought me to you. I thank you for all your support over the past 4 years of my real estate career. I hope you feel as though I’ve been there for you the way you’ve been there for me. Wishing you and yours all the best for the holiday season and a fantastic start to 2009, the year we push this economy back into high gear! Market Recap & Prediction: I’m expecting a huge rush of people buying in January and February because of the government dropping mortgage rates. · The government is considering dropping rates significantly in January for loans under $417K!!!! Contact me about this!!!! 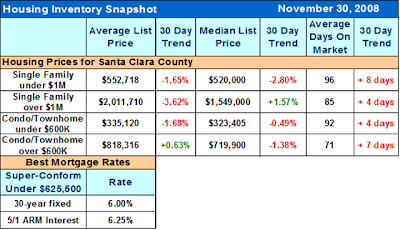 The housing stats I’ve reviewed and interest rates below are consistent with the beginning of the holiday season. We still have about 6 and a half months supply of housing. In this type of market, deals can be made. The buyers in this market can negotiate great deals and if you are purchasing for the long term, now is a great time to purchase when prices are low and interest rates are desirable. Also, I have a client who is looking for someone to purchase his condo and then turn around and rent it to him. The property is right next to Ebay and it should sell for about $490K. He is willing to pay above market rent for it while he stays there. If you are interested in a turnkey investment property like this please contact me.